HOLLYWOOD, Calif., Jan. 5, 2018 /Christian Newswire/ -- Oscar-considered filmmaker Richard Rossi's feature 'Canaan Land,' tops a list of most-anticipated independent films of 2018 that includes a documentary about Robin Williams, a retelling of Hamlet by Claire McCarthy, and the latest films from Spike Lee and Lars Von Trier. Although Rossi's story of a female evangelist (played by Rebecca Holden), who falls in love with a con-man (played by Rossi) is still shooting, he shared excerpts at Screen Actor's Guild and to industry insiders and received a standing ovation. "Rebecca Holden and Richard Rossi's acting is stellar. Rossi's a former evangelist exorcising his own demons as he shares his journey from fundamentalism to freedom," Victoria Evans said, who wrote articles about the film. "Everything about this is unique," Jack Bernstein, a contributor to IMDB, and Variety said. "It's a faith-based film, yet edgy. Scenes are shot in an iconic Hollywood nightclub, Rossi performs music with musicians from the Red Hot Chili Peppers/Dead Kennedys. In one scene, Rossi and Holden talk and walk through the Venice boardwalk and its collection of bohemians and weirdness, that continues without cutting." Rossi persuaded cast and crew to volunteer to achieve his vision that started as a stage play he performed at Stella Adler Theater in Hollywood. 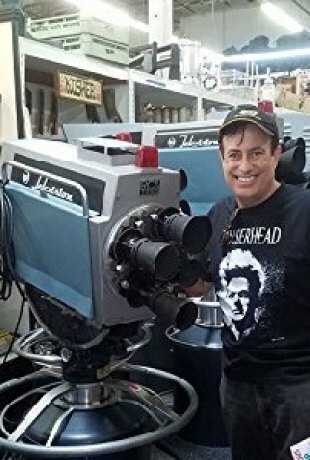 Rossi's a prolific filmmaker best known for writing, directing, producing, and acting in the award-winning feature films "Sister Aimee: The Aimee Semple McPherson Story" (2006) and "Baseball's Last Hero: 21 Clemente Stories" (2013). Thousands were considered for the lead role of Sara Sunday that eventually went to Holden. Holden's pal David Hasselhoff first gave the classically-trained singer a chance to act in a lead opposite him in the hit show "Knight Rider." Holden played April Curtis, a mechanic who fixes the computerized K.I.T.T. car. "Rebecca's gone from the woman that heals K.I.T.T. to one who heals hearts in Canaan Land," Rossi said. "I'm delighted to be cast and enjoy working with Richard," Holden said. "The role demands a reverence for the responsibility of what is required." "Sister Sara is motivated to serve God and people," Holden said. "Billy is more self-motivated. The script makes the point that we must keep our eyes on God and have discernment in choosing spiritual leaders. Leaders are human and disappoint us. Only God can provide unfailing love." "My films are about faith, and they're made on faith," Rossi said.